Stock picking can be a hugely rewarding way to build wealth, but it often requires a large time commitment that some investors simply don't have. That's why using index funds can be a great way for time-strapped investors to gain exposure to the markets. So which index funds are a good bet for the long term? We asked a team of our Motley Fool investors to weigh in and they picked Vanguard Small-Cap Value ETF (NYSEMKT: VBR), Vanguard Total International Stock Index Fund (NASDAQMUTFUND:VGTSX), and Vanguard Total Stock Market ETF (NYSEMKT:VTI). Keith Speights (Vanguard Small-Cap Value ETF): What kind of stocks have performed the best over the long run? Small-cap stocks have beaten large-cap stocks. Value stocks have beaten growth stocks. And when you put the two together, you really have a winning combination. I think the best way to invest in small-cap value stocks is through the Vanguard Small-Cap Value ETF, which attempts to track an index of value stocks of small U.S. companies. 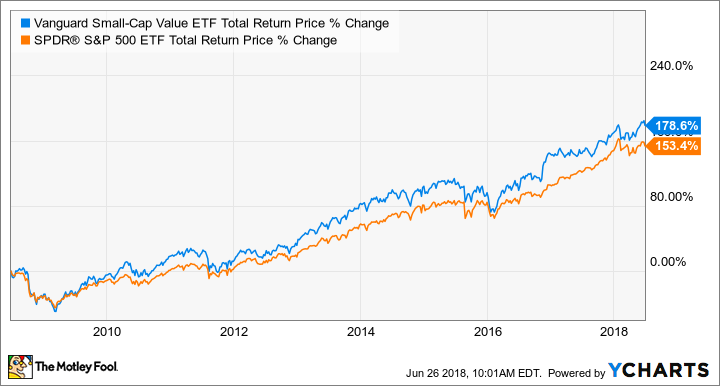 Over the last 10 years, the total return of this ETF (which includes stock appreciation plus reinvested dividends) has handily beaten the total return of the S&P 500. VBR Total Return Price. Data source: YCharts. But why does this ETF perform so well? One reason is that small-cap stocks simply have more room to grow than large-cap stocks. Another factor is that while stock prices generally tend to move higher, there's still some reversion to the mean. In other words, overvalued stocks over the long run tend to become less expensive, while undervalued stocks tend to regain some of their value. That makes the valuation focus of the ETF a nice plus. Surprisingly, the Vanguard Small-Cap Value ETF currently even pays a slightly higher dividend yield than S&P 500 index funds do. A little advantage with dividends can go a long way over time. I especially like the Vanguard family of ETFs because their expense ratios are really low. The Vanguard Small-Cap Value ETF, for example, has an expense ratio of only 0.07%. Again, keeping a long-term perspective in mind, this low expense makes a huge difference through the years. Ever thought of investing in global brands? Neha Chamaria (Vanguard Total International Stock Index Fund): Diversification is a great way to mitigate investment risks, and I don't just mean diversifying across sectors and industries. While an index fund already offers you that, one like the Vanguard Total International Stock Index takes diversification one step further and gives you exposure to international stocks for low costs. As of May 31, 2018, Europe made up 42%, Pacific 30%, and emerging markets 20.8% of the fund's portfolio. It had only 6.5% exposure to North America. Interestingly though, the fund had the highest exposure to Japan at 17.7%, with the U.K. coming in second with 12.5% exposure. In terms of individual stocks, Royal Dutch Shell, Tencent Holdings, Samsung Electronics, and Nestle were among its top five stocks by weight. Yet, you'd be surprised to know that its top 10 holdings made up only around 8.3% of the fund's total net assets. That's because the fund held -- hold your breath -- a whopping 6,330 stocks as of May 31. Like with most Vanguard funds, the Total International Stock Index Fund has a pretty low expense ratio of 0.17%. Vanguard claims it's 83% lower than the" average expense ratio of funds with similar holdings." With some of the biggest companies and brands across the globe making it into this index's holding, I can't think of a bigger foreign fund for investors seeking exposure to international markets and upping their investing game. Brian Feroldi (Vanguard Total Stock Market ETF): I'm a big fan of simplicity. That's why I always point my friends toward the Vanguard Total Stock Market ETF whenever they ask me for investing advice. My reasoning is that this fund is so well diversified and so cheap that it truly offers any investor one-stop shopping. Let's start with the diversification part first. This one fund holds a position in more than 3,600 companies from around the world. This includes large-cap, mid-cap, and small-cap stocks that operate in every sector of the economy. This broad-based diversification should allow even risk-averse investors to sleep well at night. Like all Vanguard products, this fund is dirt cheap to own. It sports an expense ratio of just 0.04%. That's 96% cheaper than the average expense ratio of other funds that invest in a similar fashion. Turning to performance, the Vanguard Total Stock Market ETF has a long history of generating strong returns for investors. The fund has generated an annualized return of 7.14% since its inception in 2001. In total, the Vanguard Total Stock Market ETF offers investors a simple way to gain broad-based exposure to the world's economy for an extremely reasonable price tag. If you like to keep things simple then this index fund is for you.